I caught this podcast a few weeks back on NPR. If you never listen to Radiolab, it airs every Sunday night at 8:00 on Atlanta’s WABE 90.1 FM. Radiolab is a brilliantly produced show that runs the gamut of subjects, and it always parts with some compelling questions for the listener. If you check it out and decide you hate it, then we subsequently meet in the ether and chance upon the topic. . . please lie to me and say you like it too. It’s kinda my bag. In this particular episode, there is a discussion on perfect pitch, another on why we find certain sounds and types of music soothing or angering. It even gets a little existential at the end, if that’s your thing. What else do you really expect from NPR? It’s worth a listen if you have any interest in music whatsoever. 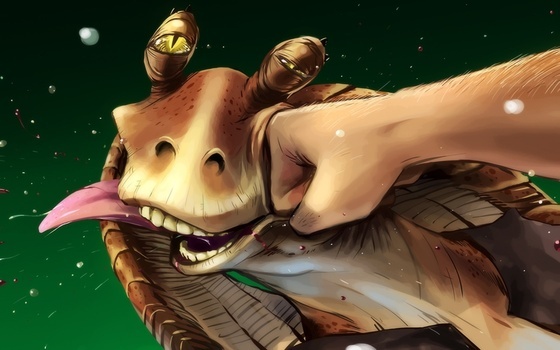 On a side note, I think Jar Jar Binks was a horrible character that singlehandedly ruined The Phantom Menace. Non-sequiteur, but I really needed to get that off my chest. Life’s too short to let that kind of stuff eat you up. ‹ Why I wish music were not so ubiquitous.